The UK has less than two years left until the clock runs out and it will officially be out of the European Union. What that means for many industries, on both sides of the channel, is not yet clear: it has not been decided how “hard” or “soft” of a Brexit the UK and EU will agree on. As a result the internet abounds with wild speculation of all types, some of which the wine industry will certainly be affected by. I will not be adding my two cents. I am not an economist and I like to keep my politics and my wine separate. However, one thing does seem to be emerging from the fray: The Winston Churchill is back. I am, of course, speaking of the pint-sized bottles of champagne (often referred to as just “The Churchill”) last produced by Pol Roger in 1973, not a zombified British Prime Minister (though someone should write that screenplay, stat). When the UK joined the European Economic Community and adopted the metric system for all goods sold in the UK in 1973, the last market for these uniquely sized bottles dried up and The Churchill was resigned to history. A single glass of champagne imparts a feeling of exhilaration. The nerves are braced, the imagination is agreeably stirred, the wits become more nimble. A bottle produces a contrary effect. Excess causes a comatose insensibility. Winston was famous for his drinking and his remarks about his drinking, especially champagne. Contrary to popular belief, however, the smaller bottle of champagne was not created for him specifically but was originally released by Pol Roger in 1874. Nonetheless he became closely associated with the bottle and the brand, reportedly drinking two pints a day during World War II (in between whiskey sodas starting at 9am, cognac, claret and a brandy nightcap). His fondness for the bottle earned the pints of champagne the nickname “The Winston Churchill.” Upon his death in 1965, Odette Pol Roger announced the company was in mourning and put a black band across the label of their Non Vintage White Foil. Understandable, as at his peak consumption Winston was supposedly $75,000 dollars in debt to his wine merchant. Don’t we wish we had him on our list today. In 1975 Pol Roger produced the first Cuvee Winston Churchill after the style of champagne he was most fond of to replace the pint sized bottle retired two years earlier. Though these were in the 1.5 liter magnum bottle. 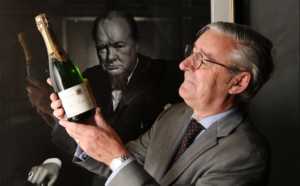 Winston once remarked “I have taken more out of alcohol than alcohol has taken out of me,” a statement which appears to ring true decades after his death with the return of the bottle of champagne most associated with him. Personally, I’m fascinated by the rapidly changing alternate-format market in wine, especially with the advent of cans both in the US and abroad. And as a history nerd I’m delighted by the nod to one of history’s greatest wine drinkers. What will be next to be resurrected? Wine in Clay amphora? I could see hipsters drinking that. Tags: brexit, champagne, Pol Roger, sonoma coast wineries, The Churchill, wine, Winston Churchill.